A three day itinerary to historic Quebec City. Our vacation to Quebec City over the summer was memorable, enlightening, and plenty of fun. While we didn’t feel overly rushed, we did maximize our few short days in the city by visiting as many places as possible. Whether you’re a history buff or a nature lover, Quebec City has something for everyone. If you’re planning an upcoming trip to Quebec and don’t really know where to start, I’m going to tell you exactly what we did throughout the duration of our three full days there. I’ll provide a couple of alternate activities in case you have time for them, too. 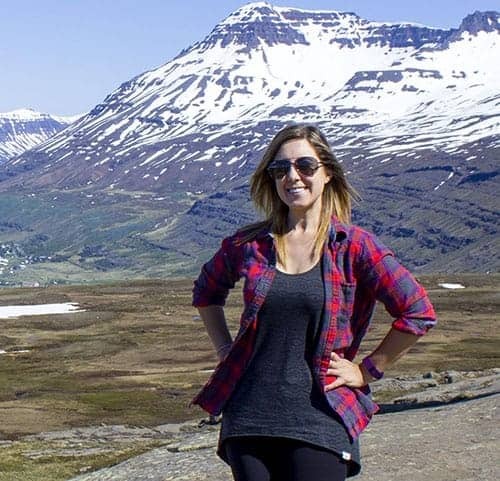 While traveling to any place in general, I think that the key is striking a balance between making the most of your time there, but not feeling like you’re rushing from place to place. You don’t want to completely burn out or feel like you need a vacation from your vacation! At the same time, it’s great if you have weeks and weeks to soak up the true atmosphere of a place, but many of us don’t have that luxury. Justin and I are only part-time travelers and only have a limited amount of time before we have to return to our regular jobs at home. It is important to visit the must-see spots that are at the top of your list, but make sure that you take some time to relax. We made sure to order some sangria while sitting on a patio at Place Royale, watching as tourists flocked to the church as we listened to the street performers across the square. One evening, we went on a relaxed bicycle ride along the river to enjoy the views. There are plenty of ways to take it easy in between some scheduled activities. 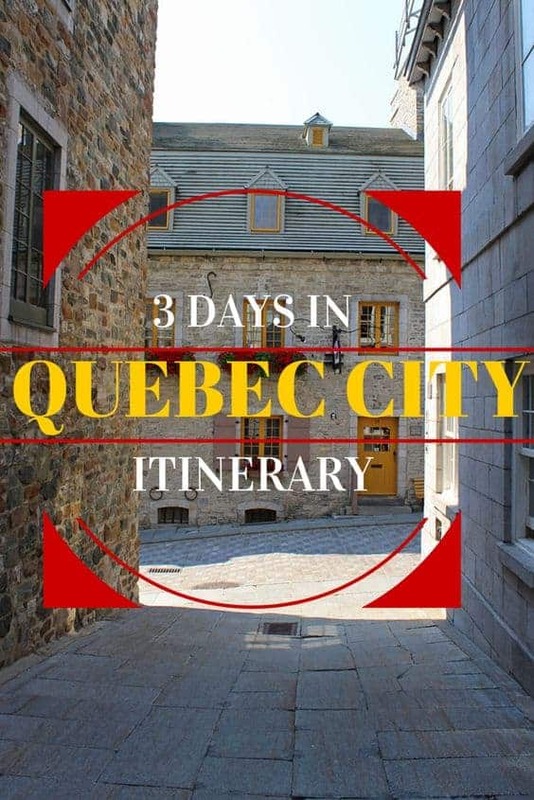 Here’s our Quebec City 3 Day Itinerary. I’ll make note of the places we visited, our overnight accommodations, and the restaurants where we dined. On our first driving day of the trip, we departed from the Toronto area and didn’t arrive until around 6:00pm. On our first evening in town, we ate dinner at Chez Victor, and wandered around Lower Town of Old Quebec, checking out the Unusual Passages Outdoor Art Exhibition. We spent our first evening overnight at Le Saint-Pierre Auberge Distinctive. Here’s our full review and the reviews and photos from fellow travellers. DAY 1: WALKING, WALKING, WALKING! Have you visited Quebec City? What do you love most about it? This day was our first time truly exploring Quebec City. We had the basic plan of walking all over town, hitting up some historical places and interesting buildings along the way. It made the most sense to start in Lower Town as our hotel was near the St. Lawrence River, Place Royale, and Quartier Petit Champlain. If your hotel is in Upper Town, you might start up there and make your way down below later in the day. We visited Place Royale, a historic plaza and the Notre-Dame-des-Victoires church there. Be sure to take a peek inside the church as it is ornately decorated (and free of charge to enter!). You can enjoy a drink or a coffee on a patio here or do some shopping. It’s also great to just walk around and snap some photographs! As you walk a little further, you will come across a very popular and cute neighbourhood in town, Quartier Petit Champlain. You’ll notice tons of souvenir shops, clothing stores, and local artists selling their wares. This is likely one of the more expensive places in town due to the influx of tourists, so you may want to shop elsewhere in town for better prices. This is also where the Funicular and the Breakneck Stairs as located where you can travel on to Upper Town, Old Quebec. From here, you can take the Funicular car (or the stairs!) to the top of the escarpment. We took the Funicular on our first time there to enjoy the views of the river as we rode to the top. Once you reach the top, you’ll see the massive, iconic Chateau Frontenac, a famous hotel in the city. It is thought to be the most photographed hotel in the world, so why not join in on the fun? There were always musicians or singers performing along the boardwalk, though one lady we saw there a couple of times was clearly lip-syncing! We also went inside the lobby of the extravagant hotel just to check it out. We thought of coming back here for a drink at the bar, but never ended up getting the chance. Though we aren’t religious, we stopped to admire the architecture and decor of the Notre Dame de Quebec. We also had the rare opportunity to pass through the Holy Door. While we didn’t discover it until our second evening in town, there is a courtyard and garden on the grounds of the church, too. As we walked up Rue Saint-Jean, we came across the fortification wall of Quebec City. It is one reason why Old Quebec is a UNESCO World Heritage site, as it is the only remaining walled city in North America, north of Mexico. We climbed up the stairs and walked along the wall, passing over the city streets below. Eventually, we reached the Citadel where you will find ceremonial guards and a museum. There is also a changing of the guards ceremony that takes place in the summer months at 10:00am, though we missed it. From the Citadel, we walked along the edge of the Plains of Abraham until we reached a lengthy boardwalk between the fortifcation wall and the escarpment overlooking the St. Lawrence River. This boardwalk is called the Governors’ Promenade and it consists of many stairs and fantastic views. We ended up walking down most of these flights of stairs rather than up – if you’re looking for a great exercise, perhaps start at the Dufferin Terrace and walk towards the Plains of Abraham! We didn’t mind going down the flights of stairs as we had walked around for most of the day already at that point. Eventually, you’ll be back where you started in Upper Town, at the Chateau Frontenac/Dufferin Terrace. We were starving at this point, and we were pretty desperate for a good meal. We figured that we would be able to easily find something vegetarian, even if it was just pasta or pizza. This proved to be more difficult than it sounded. Many places in the tourist areas around the Dufferin Terrace and Rue Saint-Jean didn’t offer anything remotely vegetarian on the menu! Luckily for you, if you’re vegetarian or vegan, I have planned out this vegan guide to Quebec for you after we returned from our trip. Unfortunately for us, we settled on the first place that we stumbled upon that had a pasta that was vegetarian – Trattoria di Mike’s, a Quebec Italian chain restaurant. The food tasted fine (not great or anything special), but it ended up giving us both a stomach ache as we walked around for the next hour or two. If you can avoid that situation, please do! Eat great food while you are on holidays! Thankfully, we didn’t run into that problem again in Quebec City. This is the oldest grocery store in North America, so we had to take a peak inside! There were a variety of interesting things for sale, although nothing that I haven’t seen elsewhere at home. Perhaps if you are visiting Canada or Quebec from overseas, this store may be more interesting or appealing to you. You might be able to find things like maple syrup and other typically Canadian items for less money elsewhere, though they did have a great collection of tasty treats. If you want to see a view of Quebec from above it all, take a trip up the elevator to the Observatoire de la Capitale. I would plan to spend 1-2 hours here so you can fully absorb all of the 360 degree views, as well as their short history videos about Quebec. We explored the exterior of the Parliament Building and its beautiful gardens on our way back towards the Funicular/Breakneck Stairs. We decided it was time for a mid-afternoon coffee break. While there are tons of chain coffee shops (yes, please enjoy the Tim Hortons if you don’t have one in your hometown! ), we have all of those right near our home. We went to Les Cafes du Soleil in Lower Town to enjoy some delicious coffee in a quaint shop made for coffee connoisseurs. It was also a great time to unwind and relax after such a busy day. Another way that we relaxed while enjoying some beautiful views of the Quebec skyline was by taking the ferry round-trip to Levis and back. It took about an hour to ride around the harbour, and was definitely one of the most inexpensive activities of the day at just over $3 per person. Besides the gorgeous views, it felt great to have a fresh breeze off the river on my face after walking around on a hot, summer day! Feel free to use our Vegan Guide to Quebec City to choose a spot to eat dinner. We ate at Spag&Tini that night in Lower Town. We stayed overnight at Le Saint Pierre Auberge Distinctive in Lower Town, Old Quebec. It’s always good to factor in rainy day activities while traveling. It’s bound to happen, right? Thankfully, there are plenty of things to do indoors in Quebec and these were on our list anyway. I suggest saving these activities for the day when it’s most likely to rain. There are so many great outdoor activities in Quebec, and you want to save the sunny days for those ones! This was an easy choice for us: the Musee de la Civilisation was right across the street from our hotel. There was a powerful exhibit on display called Haiti in Extremes that showcased the works of Haitian artists. These expressions of creativity highlighted themes such as death and life, and living with the struggles during natural catastrophes, harsh living conditions, poverty, and political unrest. These images were at times controversial, but very thought-provoking. Through this exhibit, I was able to learn more about Haitian culture and Vodou religion. We didn’t explore too many other areas of the museum besides this exhibit, though there were some permanent installations about the history of Quebec. You can consider going to the Musée National des Beaux-Arts du Quebec (fine art museum) instead, or go to both if you love museums! We didn’t have time for both, unfortunately. We stumbled upon this graffiti while walking to the restaurant, Le Tier Temps. You can discover this street art along Rue Saint-Vallier E as you approach the Saint-Roch neighborhood. We enjoyed a delicious meal at Le Tier Temps in the Saint-Roch neighborhood. We highly recommend checking it out! (Update: This restaurant is now closed). After lunch, we walked up the Lepine Stairs to Upper Town. We visited the Morrin Centre, Quebec City’s first prison, English college, English cultural centre and English library! It’s quite the building, and we truly enjoyed our tour there. The guided tour lasts approximately an hour. If you’ve got a sweet tooth, be sure to stop by Erico Chocolaterie for a scoop of ice cream (or in my case, vegan soy chocolate ice cream!) and some chocolates! We ventured back to Place Royale and enjoyed a pitcher of sangria on the patio of La Pizz. It was a great spot to relax, chat, and people watch! As you can probably guess, it stopped raining and became sunny outside once again! We had a great meal at La Petite Dana, a Vietnamese/Thai restaurant in Lower Town. As day became night, we went for a short walk around Place Royale, Quartier Petit Champlain, and around the Notre Dame de Quebec in Upper Town. Quebec City has an entirely different vibe at night once most of the tourists have left for the day. It is very quiet and peaceful. Also, Quebec City is extremely safe, so you don’t have to worry about wandering around when it gets dark outside. Also be forewarned: many restaurants are closed after 9:00pm, which seems very early to me. Be sure to eat before 9pm or check the restaurant hours. We stayed overnight at Hotel 71, a sister hotel to Le Saint Pierre Auberge Distinctive located right next door. Read our full review and check out the reviews and photos of fellow travellers. We left Quebec City today and visited some of the gorgeous natural locations outside of the city. If you love nature, waterfalls, or quaint countryside, be sure to check out these hidden gems. Ile d’Orleans is an island just outside of Quebec City across the St. Lawrence River. It is thought of as the Cornucopia of Quebec as the people rely on farming traditions to sell fresh produce, preserves, wine, and more. We spent a few hours here circling the island to view beautiful scenery and taste the fresh fruits and veggies! If you love waterfalls, you will love Canyon Sainte-Anne. About a half hour away from Quebec City in the town of Beaupre, Canyon Sainte-Anne offers scenic hiking trails and incredible views of a spectacular canyon from multiple positions, including a bridge that’s suspended across the gorge. While we elected to visit Montmorency Falls on following morning before we drove home from Quebec City, you could quite possibly fit it into your day after going to Canyon Sainte-Anne. It might be a little rushed to visit all three places in one day. Montmorency Falls is a great option if you don’t have a car as I believe you can take the train there from Quebec City. It is a breathtaking waterfall that’s even higher than Niagara Falls. I highly recommend that you visit! We were able to borrow bicycles from our hotel, Hotel 71 whenever we wanted, which was a fantastic perk of being a guest there. There are several places where you can rent bikes in Quebec City if your hotel doesn’t have any to lend out. It was a great experience being able to cycle along the paved path that ran parallel to the St. Lawrence River. 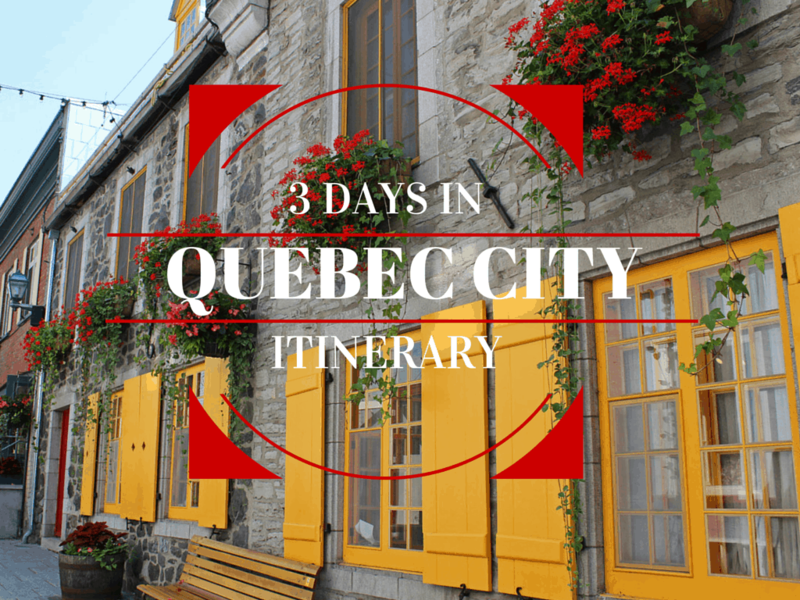 I hope that my Quebec City 3 Day Itinerary gives you some ideas to plan a trip of your own! Please post any questions that you may have in the comments section, and I’ll try my best to answer them for you! We stayed at Le Saint-Pierre Auburge Distinctive and Hotel 71, two sister hotels with a very different style. If you’re looking to explore more choices, there are hundreds of hotels in Quebec City in Lower Town and Upper Town. Take a look! Since writing this post, we’ve travelled to Quebec City in the winter (in late November and in February). Here’s how to plan your perfect Quebec City winter itinerary. Interested in more Quebec and Canadian travel? Check out our entire Canada page! I, too, love Quebec. Taking the evening ferry cruise is another great way to enjoy the surroundings (and mellow out with some wine. Enjoy the lights! Great guide! Although I will (sadly) not be drinking Sangria on a Patio in December (i’m aiming for for Gluwein at the markets ;) ) I will definitely keep these ideas in mind! I for sure need to check out the Observatoire- I missed it last time! This is a insight to the city and if you are only travelling for a few days gives a very concise commentary on what to see and do. I am surprised that you struggled to find vegetarian food on the first evening though. Being a vegetarian myself I have noticed an increase in offerings around the world that were not available a few years ago. Knowing that I might struggle in such a large city to find something without prior planning is good to know. Quebec city is so wonderful to visit! I’ve been a few times but I haven’t seen all the things you managed to in only 3 days! Thank you for such a great itinerary. I’m a big fan of your Quebec City posts and this round up is the perfect way to help me prep an itinerary for when I’ll eventually visit! I especially like the natural attractions, but the street art is good too! Thanks for such an informative post! I’m currently planning a trip to Quebec City from Toronto and we will be flying in from either Friday-Monday or Thursday to Monday. I wanted your opinion based on your trip, whether we will need the extra day in Quebec City or if you think 4 days is sufficient! If you’re flying in, I think that 4 days would be sufficient! We drove and it took 5 days in all, but 2 of them were mostly spent driving. If you’re going to fly, I think that’s a good amount of time! I hope that this was helpful to you! Let me know if you have any other questions! Run across your write-up for a 3 day trip in Quebec and found it very informative. I’ll carry it with me during our planned trip in two weeks. We’re planning of flying in and stay for 5 days. Any other places in nearby Quebec for the other 2 days? Thanks for checking out this article. As for a budget of $500 for 4 nights…it might be a bit tricky in the high season (if you’re going in the summer). We stayed at two different hotels in Lower Town that were AWESOME, but I’m not sure if they’ll fit into your budget. As for other places to stay, I don’t have any personal experience. 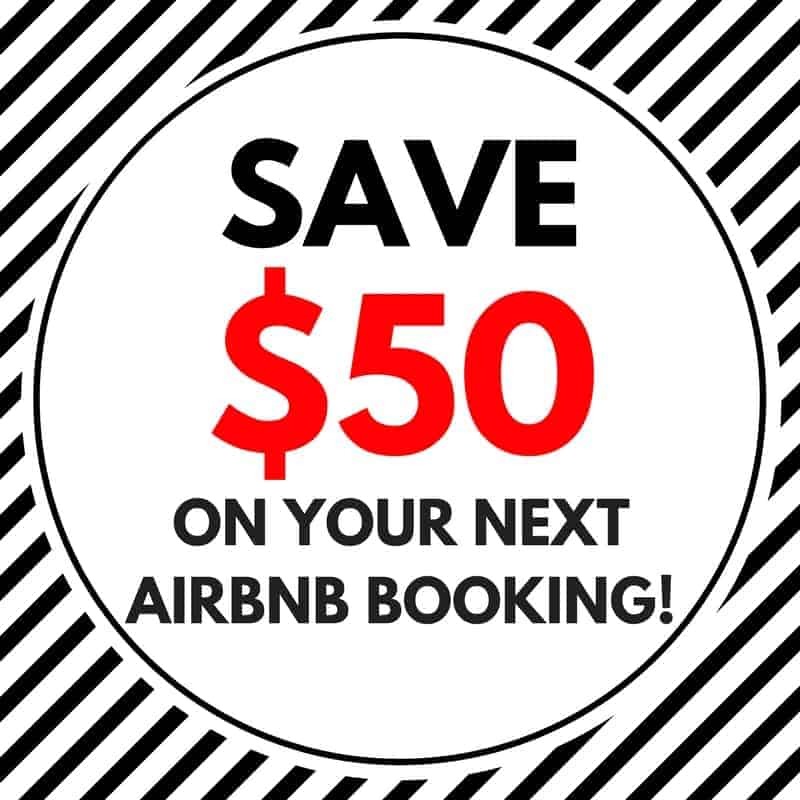 Hi: In order to save money since you have 5 days, you can always book across the river in Levis. Take into account the roundtrip per person $7.00 you will pay each day. We booked thru airbnb and saved alot of money!!! Just bring a packsack and know you will be leaving in the morning and not coming back til the evening. This would fit in your budget!! Don’t you just love Québec! My boyfriend is from Lévis so we go often, I’ve taken that ferry ride to Québec and back for the summer music festival many times, which I highly recommend getting tickets to! Lévis is not an island though, just to point out. There are great views from over there and if you get a chance to walk around old Lévis it has a lot of unique character as well. Great post, thanks for sharing! That’s awesome, Deidre! Thanks so much for pointing that out about Lévis – you’re totally right and I’ve edited it to reflect the change. The ferry ride is quite beautiful with awesome views. I’ll have to actually check out Lévis sometime as it sounds lovely! Thanks for this wonderful itinerary. I am just wondering if they accept US dollars at most attractions? Did you have to carry cash Canadian Dollars at all and if so where did you get them exchanged? Hi Samuel! Are you traveling to Canada from the US? I would recommend that you exchange your money ahead of time at the bank. If not, you could likely use a local ATM to withdraw Canadian money, or do it at the airport (though the exchange rate won’t be as good). I’m not sure if many places will accept US dollars – they most likely would, but you might lose money on the exchange rate. I would try to use Canadian money! I don’t have much experience with this unfortunately as I am Canadian and didn’t have to exchange any money before my trip. Hi Lauren! I’m arriving Sunday late afternoon by train to Quebec City, have full day Monday and leave on the train at 5pm… Is that enough time to see most of city (plains/old Quebec/terrasse etc…) and take a bike ride Montmoncery Falls in that allotted time? Thank you!!! Hi guys! I will be visiting Quebec on spring , I’m a real control freak and I’m working on my itinerary, I´m planning one day to see the Rural countryside: Montmorency Falls, Sainte-Anne-de Braupé and Ile d’Orlenas. Do you know how can I go from Montmorency Falss to Saint Anne de Braupé by bus or train? And wich places inside Ile d´Orleans do you strongly recommend? What a detailed itinerary! My girlfriend and I will be visiting the city in December and this guide is super helpful in giving us some ideas on what to check out. I especially loved your article about the stairs and the funicular as well. Can’t wait to explore the city! Hopefully I can make a trip there this summer to check out all these spots!